Libraries are places where people can seek advice and meet others. The digital services are also intended to reach out to children and young people who would otherwise be unlikely to visit a library. Ms Hartmann, what contribution can libraries make to the promotion of reading? Quite a substantial one, I think. And I don’t just mean providing free access to printed books and to the broad spectrum of events available to all age groups. For quite some time now libraries have been defining themselves as places that offer the complete range of media with which we are nowadays confronted. This embraces not only digital media, but also printed text on paper. And it is this variety of media in particular that provides an excellent opportunity to reach those people who have problems dealing with the traditional medium of the book. In the meantime libraries have started exploiting the possibilities of using the digital media to promote reading, making it more up-to-date and innovative. For children, in particular, dealing with books has always been a challenge. Now, with the help of all the multimedia services available they can be encouraged and supported in a most positive way. Within the framework of our project entitled Lesen macht stark: Lesen und digitale Medien (Reading is Strength – Reading and Digital Media) our aim has been to develop such activities and put them into practice. Could you tell us what this project is about in concrete terms? Lesen macht stark is an integral part of a large-scale, comprehensive program called “Kultur macht stark. Bündnisse für Bildung” (Culture is Strength. Education Alliances) that was launched by the German Federal Ministry for Education and Research. This is the first time a relatively large sum of federal funding has been used to promote extracurricular, cultural education projects for so-called educationally disadvantaged children and teenagers at a local level – to be exact 230 million euros over a period of five years from 2013 to 2017. This has prompted associations and action groups all over Germany to develop their own independent projects that have spawned local alliances consisting of several partners, in order to be able to apply for funding. How is your project being put into practice? Kathrin Hartmann | Foto (Ausschnitt): © dbv, Tristan Vankann We gave long consideration to how we could support those children and teenagers who would not necessarily hit upon the idea of going to a library themselves and who have missed out on any previous reading promotion projects. Five age-related initiatives were developed for this that targeted children and teenagers between the ages of 3 and 18. The initiatives included a digital picture-book cinema for which children are provided with audio pens with which they can access the picture books. Whenever they touch a part of the text with the audio pen, additional helpful information can be heard in the form of an audio pop-up. And what about the older children? For the older ones it is geared more to improving their information and media skills. What possibilities do digital media offer to further consolidate what has been read. In this case we do not just mean providing instructions on how to do effective research on the Internet. The aim is to encourage the children and teenagers to be creative themselves. For example, by continuing a story with the help of various media or by writing their very own story – either in written form or as a story illustrated with photos that can be viewed on a tablet computer. What role do the social media play here? Quite an important one. First of all our local alliances offer 13 to 15-year-olds the possibility of getting to know a book within the framework of a public reading at local level by the author and then to talk and exchange ideas about it via various social reading platforms on the Internet. Once again, the idea in the end is to get them to be active themselves, not just to exchange ideas in written form, but to get them to continue the story themselves – working communally with others if they want, basically to get them into digital storytelling. Doesn’t that put a lot of strain on children who already have a hard time reading a book? It is a challenge, no doubt about it. Although it might come as a surprise, we have, in fact, observed that the children have an amazingly great interest in writing and realising their ideas themselves. And this is ideal for the promotion of reading. In the best case scenario writing themselves and talking to others about texts can trigger an enthusiasm for reading, too. Especially as the children read and notice that there is – outside school – actually a lot to discover that is close to their interests. In addition – teenagers realise that reading is also a social activity. Reading does not necessarily mean sitting alone in a corner and maybe ploughing tediously through a book. Digital media have now made it possible to experience reading on an interactive, communal level in all kinds of ways. Not all educators and teachers have welcomed the use of new media with open arms. Alongside the possibility of motivating pupils many also see the danger of a media overload. What is your view on this? I think the use of digital media can only be of use if it does not become an end in itself, it should provide real added value. The imparting of traditional cultural skills like reading and writing can only benefit from the new media if they are used to consolidate the reading experience and not for the purposes of distraction and the pure consumption of additional content. For example, by showing children and teenagers how to use a search engine? Yes, but not just that. The good thing about libraries as modern places for imparting knowledge is also the fact that they bring together old and new media in a way that is really quite harmonious and effective. In the digital society libraries are important non-commercial enterprises that provide personal consultation and encounters. Particularly in our increasingly digitalised society, a society in which children and teenagers in their everyday lives have less and less contact with books, libraries offer an environment in which it can still be quite natural for a so-called “digital native” to look up from his tablet, walk over to the nearest bookshelf and take out a book. 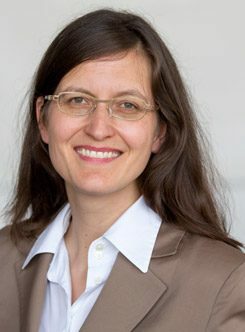 Kathrin Hartmann manages the projects and programs section of the Deutscher Bibliotheksverband (German Library Association) and is coordinator of the Kompetenznetzwerk für Bibliotheken (Library Network of Expertise). She is also head of the management of the Lesen macht stark: Lesen und digitale Medien project. Klaus Lüber conducted the interview. He is a cultural and media scholar and works as a freelance author for “Süddeutsche Zeitung”, “Die Zeit” and “Die Welt”.